I study at Indaraktevi High School, and starting in September I will be going into grade 9. My school is lovely – people say it’s the most beautiful school in Phnom Penh. I like the football and sports field where I can enjoy time with my friends at school. However, I dislike the school toilets and the canteen because they are so ugly and unhygienic, and no one ever cleans them. Another thing I dislike at school is bullies because they normally make trouble: they get into fights and make other students scared. My favorite subjects are mathematics and Khmer language because they are the most important subjects and I can score 100 per cent in them. Other subjects are only scored out of 50 per cent. In school, I used to have a best friend, but unfortunately, we stopped keeping in touch with each other because we had an argument. In my family, even though I am the youngest son, it doesn’t mean I can get everything because my parents and my brother always limit me. However, I like what they give me, and my favorite possessions are my bike and watch. 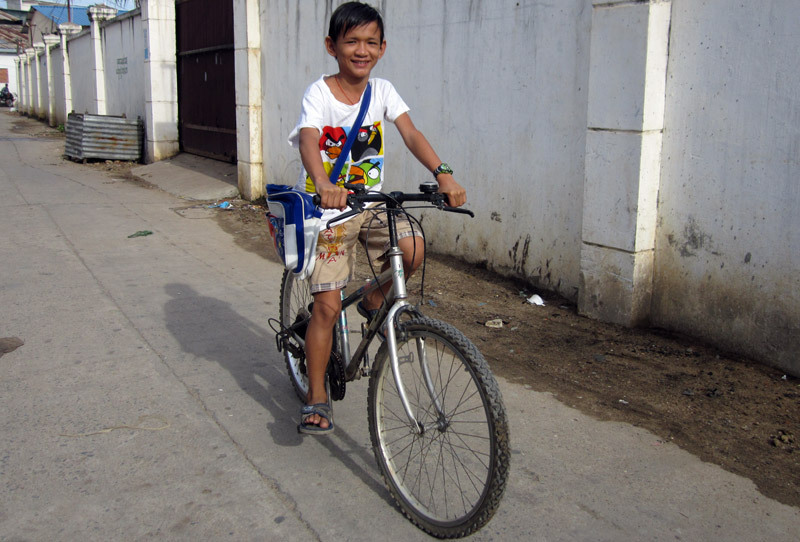 My bike helps me to travel to school while my watch has an alarm that helps me to get up and go to school on time. They are both absolutely always my best companions. In my spare time, I like reading books and meeting friends, and I don’t mind doing some housework when my mother needs me to help her. I also like playing ‘Angry Bird’ and ‘Zombie’ computer games because they are really cool.